BOOM! 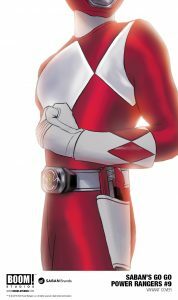 Studios and Saban Brands announced today new chapters of POWER RANGERS: SHATTERED GRID, available at comic shops in May 2018. 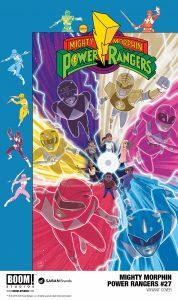 Lord Drakkon—a twisted, alternate-reality version of Tommy Oliver, the Green Mighty Morphin Power Ranger—is growing more powerful with every battle against Power Rangers teams across history…while in the past, a mysterious new Ranger arrives to challenge the Mighty Morphin Power Rangers on their own turf. 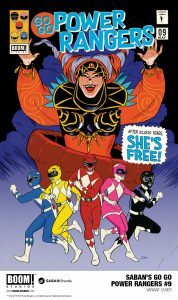 Saban’s Go Go Power Rangers #9, from writer Ryan Parrott and artist Dan Mora, introduces a new Power Ranger into the Mighty Morphin Power Rangers mythology, one with a surprising connection to Lord Drakkon! But why has this mysterious new character traveled back to the past to target the Power Rangers during their early days as heroes…and who is under the helmet? 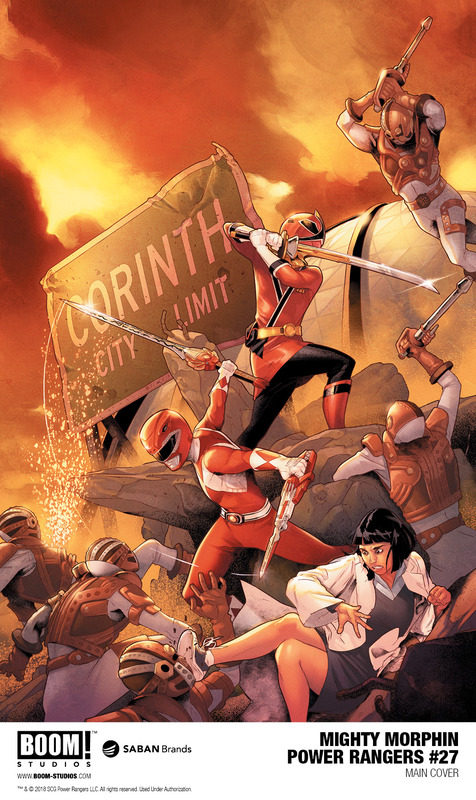 Both answers will rock the Power Rangers to their core and dramatically impact the events of POWER RANGERS: SHATTERED GRID. 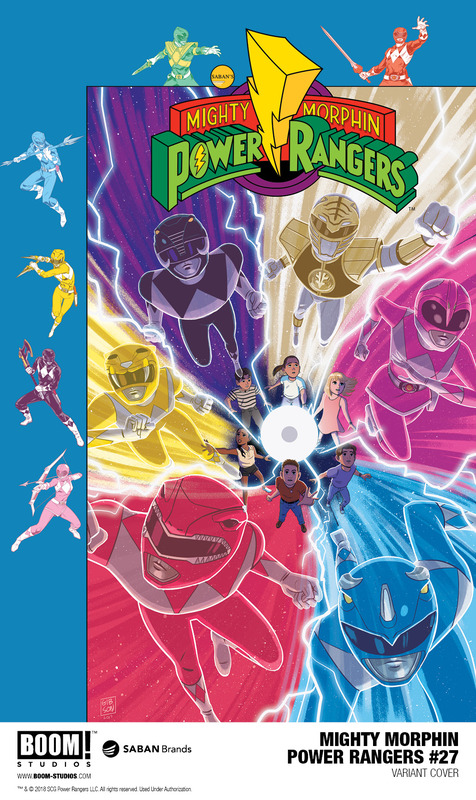 This issue features a main cover by Mora, with variant covers by Miguel Mercado (Over The Garden Wall), Audrey Mok (Archie) and Natacha Bustos (Moon Girl & Devil Dinosaur). 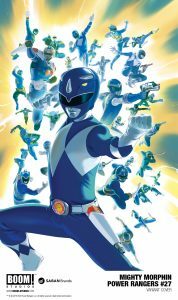 The debut of this new Power Ranger follows the landmark introductions of Lord Drakkon in 2016; the Power Rangers of 1969 in 2017; and the Green Psycho Ranger in 2017, all in the pages of Mighty Morphin Power Rangers. 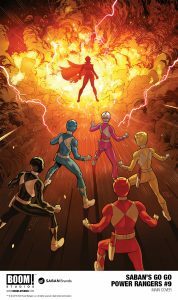 In Mighty Morphin Power Rangers #27, from writer Kyle Higgins and artist Daniele di Nicuolo, Lord Drakkon’s power and influence grows, as the Power Rangers work with new allies from across time and dimensions, including Ranger teams such as Time Force, RPM, and Samurai, to craft a plan to fight back. But is it already too late? This issue features a main cover by Jamal Campbell (Green Arrow), with variant covers by Jordan Gibson (America) and Carlos Villa (Lockjaw). 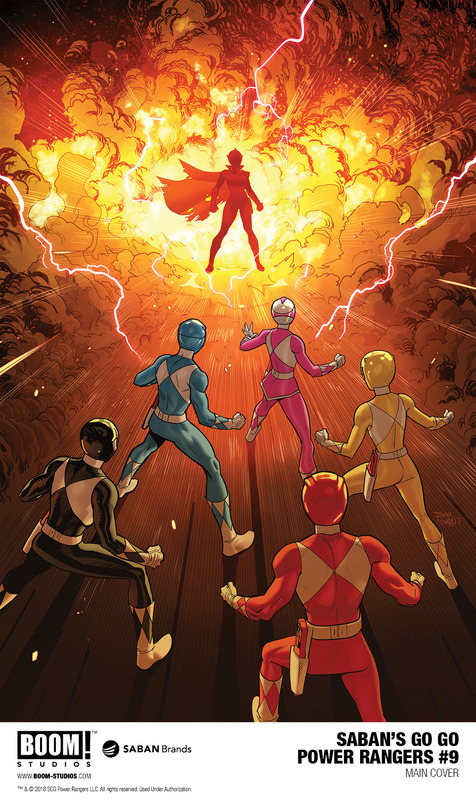 “As part of Saban’s Power Rangers 25th Anniversary, we felt it was the perfect time to further explore the franchise’s mythology and debut new characters with BOOM! Studios to make POWER RANGERS: SHATTERED GRID a legendary comic book event like nothing we have done before!” said Brian Casentini, Executive Producer, Power Rangers Franchise.